Tomb of Isa Khan Tarkhan II - Photo provided by Paul Tanner. The Historical Monuments of Makli, Thatta reflect the city's importance as Sind's capital and as a centre for Islamic arts. From the 14th century four Muslim dynasties ruled Sind from Thatta, but in 1739 the capital was moved elsewhere and Thatta declined. In December 2017, I made a day trip from Karachi to Makli necropolis, about 60 miles to its east, which might be the world’s largest funerary site -- the ten square kilometer burial ground contains approximately one million tombs, mostly built between 1570 and 1640. Almost as interesting as the abundant tombs, were two elderly snake charmers who set up shop along the dirt path leading from the entrance to the tombs. The snake charmers seek visitors to fund a musical performance on the pungi, the wind instrument whose rhythmic sound and movements appear to hypnotize a de-fanged Indian cobra. Their second act is to entice visitors to purchase a serpent to battle an Indian mongoose to the death, although the mammal’s acrobatic agility, coarse coat and resistance to snake venom ensure its victory. For less than a dollar, I bought a common water snake to challenge the mongoose, but in order to maintain their inventory, my bout was interrupted by a snake wrangler who separated the two combatants. 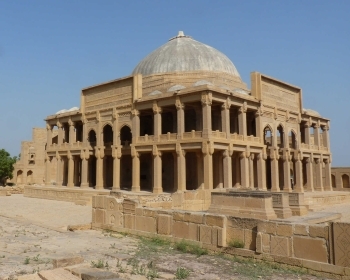 While on the way to and from Makli, I visited three locations on Pakistan's list of tentative World Heritage Sites: Chaukhandi Tombs, an early Islamic cemetery; Shah Jahan Mosque, a 17th-century mosque known for its geometric tile and brickwork; and the Port of Banbhore, an ancient city dating to the 1st century BCE. I made my arrangements with Travel & Culture Services (https://travel-culture.com). Grand in the truest sense of the word. Thatta is an awe inspiring place, magical and yet sad. All efforts should be made to preserve this area as it not only belongs to the whole of humanity to cherish and be called its own, but it also instills in man the sure knowledge that in the overall scheme of things, man's place is inconsquential, and yet at the same time he really is the centre of all creation. Fantastic place, rich with historical items, mild weather and friendly noble people of town thatha, mosque is shows the technical power that mughals possessed, centries ago. Thatta a marvellious city, an ancient symbol of architect, all the monuments, shrines and mosques needs immediate rennovation...!!! all the money which the authorities r getting is landing in their pockets.... how sad !!! Thatta, or Tatta, is a historic town of 22,000 inhabitants in the Sindh province of Pakistan. Its major monuments are listed among the World Heritage Sites. The city, formerly commanding the delta of the Indus, was the capital of Lower Sindh from the 14th century. Since 1592, it was governed in the name of the Mughal emperors of Delhi. 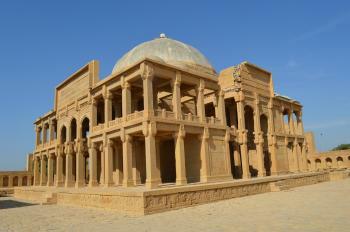 After the province was ceded to Nadir Shah of Persia in 1739, Thatta has fallen into neglect. Thatta's monuments include the Jama Mosque, built by Shah Jahan in 1647-49 and lined with glazed tiles. There are also the tombs of Jam Nizamuddin (reigned in 1461-1509), several Tarkhan rulers and Mughal officials. A vast old necropolis with thousands of graves may be found at the nearby Makli Hills. really an amazing place to see, Asia larget graveyard and kenjhar lake, u will be surprised to see the ancient historical graves at Makli graveyard. mosque yes it is great and then kenjher lake. From "Historical Monuments of Thatta" to "Historical Monuments at Makli, Thatta"
Sir Richard Francis Burton: He was appointed to the Sindh Survey during 1843-6. His visit is described in ""Unhappy Valley" and "Sind and the races which inhabit the valley of the Indus"
Sufism: "Makli Hill. One of the largest necropolises in the world, with a diameter of approximately 8 kilometers, Makli Hill is supposed to be the burial place of some 125,000 Sufi saints"
Inscribed element(s) removed: Was inscribed in 1981 as "Historic Monuments of Thatta" and the AB description clearly mentions "the mosque of Dabgir, and that of Shah Jahan (1644-1647)" whilst also differentiating "the archaeological site of Thatta and the necropolis of Makli". There has been no "official" redesignation of the site but it is clear from "Mission reports" that the elements outside Makli Necropolis are NOT now part of the inscribed site as recognised by the name change in 2009. The Shah Jahan mosque was also added to Pakistan's T List in 1993 as a separate item.